The node is the processing unit in the node graph. 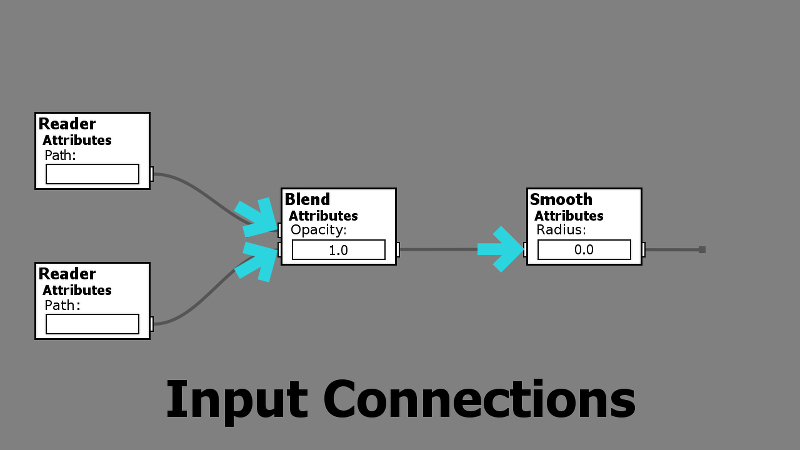 Nodes receive input values, process them and return output values. The supported values that flow through the graph are: Image, Color, Float, Bool, Int, Point2. 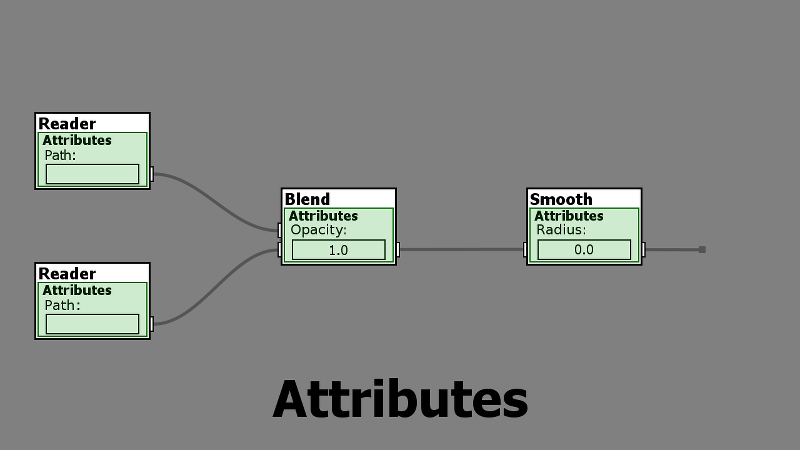 Attributes are the editable properties of the node that it uses to compute the output values. The radius of the Gaussian Blur node and the color of the Constant node are examples of attribute. String: Text values like file paths, or the text to be rendered in the Text node. Bool: Boolean values, True or False values like the grow option in the Blur node. Int: Integer numbers (i.e. 5, -3, 110) like size and position in the Resize node. Float: Decimal values (i.e. 4.38, -7.62) like the opacity value in the Blend node. Choice: Multiple choice values like the blend modes in the Blend node. The attributes of the node are edited on the Attributes Panel in the Control Panel. Attributes can be exposed as inputs. When an attribute is exposed as an input and the input is connected to a node value, the node uses the value that comes from the input instead of the value from the attribute. 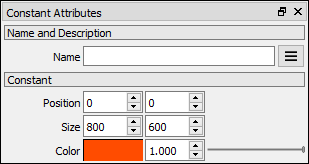 To expose an attribute as an input from the Attributes Panel right click the attribute name and check the Expose as input command in the context menu. 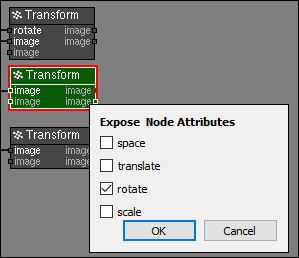 To expose an attribute as an input from the Node Graph right click the node and check the attributes in the Expose Node Attributes window. Some nodes require larger blocks of information to be able to process the output image. This information is the Node Data and is edited by the user in the node's user interface. 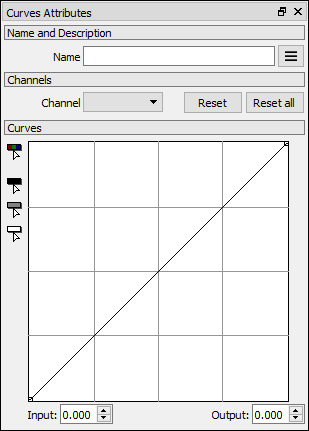 The curves attributes in the [Curves node](NodesAdjustCurve.html], and the shapes attributes in the Shapes node are examples of Node Data. Nodes that are enabled are processed by the node graph, they receive their input values, modify them, and return them as output. Nodes that are disabled are not processed by the node graph. Nodes that generate images stop generating their images. Nodes that modify the image, stop modifying the image and don't change it at all. Select some nodes and hit the E key to Enable or Disable them. The name of the node. The name is displayed on the title of the node in the node graph. A short description for the node. 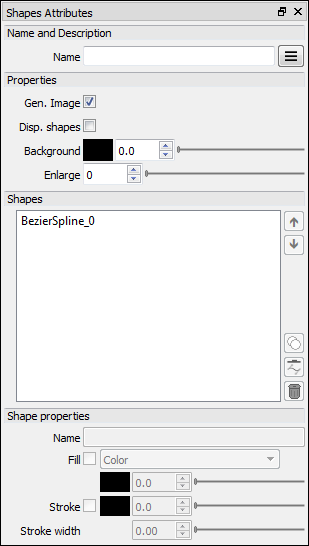 The description is shown as a tooltip when the mouse hover over the node in the node graph.